It is not known whether genetic variation in the vitamin D binding protein (DBP) influences 25-hydroxyvitamin D levels [25(OH)D] after vitamin D supplementation. We aimed to investigate the changes of total 25(OH)D, 25(OH)D3 and 25(OH)D2 in a Thai cohort, according to type of vitamin D supplement (vitamin D3 or D2) and DBP genotype, after receiving vitamin D3 or D2 for 3 months. Thirty-nine healthy subjects completed the study. All subjects received 400 IU of either vitamin D3 or D2, plus a calcium supplement, every day for 3 months. Total serum 25(OH)D, 25(OH)D3 and 25(OH)D2 were measured by LC-MS/MS. Individual genotyping of rs4588 in the DBP gene was performed using real-time PCR. 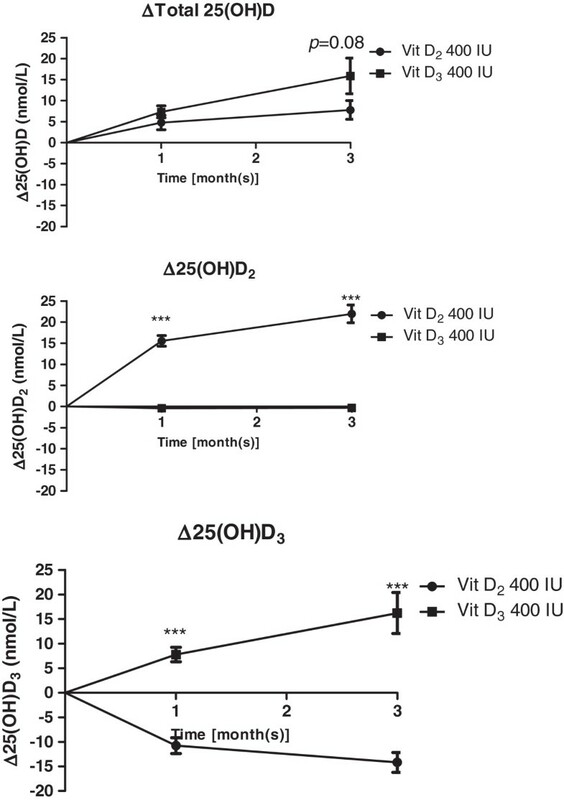 Vitamin D3 supplementation of 400 IU/d increased 25(OH)D3 significantly (+16.2 ± 4.2 nmol/L, p <0.001). Vitamin D2 (400 IU/d) caused increased 25(OH)D2 levels (+22.0 ± 2.11 nmol/L, p <0.001), together with a decrease of 25(OH)D3 (−14.2 ± 2.0 nmol/L, p <0.001). At 3 month, subjects in vitamin D3 group tended to have higher total 25(OH)D levels than those in vitamin D2 (67.8 ± 3.9 vs. 61.0 ± 3.0 nmol/L; p = 0.08). Subjects were then classified into two subgroups: homozygous for the DBP rs4588 C allele (CC), and the rest (CA or AA). With D3 supplementation, subjects with CA or AA alleles had significantly less increase in 25(OH)D3 and total 25(OH)D when compared with those with the CC allele. However, no difference was found when the supplement was vitamin D2. Genetic variation in DBP (rs4588 SNP) influences responsiveness to vitamin D3 but not vitamin D2. Vitamin D insufficiency has been increasingly recognized as a common health problem worldwide. Measures to augment vitamin D levels include increased sun exposure, higher consumption of vitamin D–rich foods, and taking vitamin D supplements. In order to achieve a 25-hydroxyvitamin D level [25(OH)D; a marker of vitamin D status] higher than the current recommended threshold of 50–75 nmol/L, higher doses of vitamin D than previously suggested are required in Caucasians [1, 2]. However, it is unclear if the suggestion holds across ethnic groups, particularly in populations with lower body fat as compared to Caucasians. Moreover, it has never been investigated in Asians if vitamin D2 or D3 supplementation would have a different effect on circulating vitamin D.
Vitamin D and its metabolites circulate in the plasma, bound to vitamin D binding protein (DBP) . Genetic variations in the DBP gene have consistently been found to be associated with 25(OH)D levels [4–7]. However, it is currently unclear how the DBP genetic variation would affect the increase in 25(OH)D levels after taking vitamin D supplements. In the present study, we investigated the changes of total 25(OH)D, 25(OH)D3 and 25(OH)D2 according to type of vitamin D supplement (400 IU of vitamin D3 or D2 for 3 months). Toward the end, we investigated the change in serum 25(OH)D levels according to DBP genotypes. A total of 41 subjects (34 females/7 males) aged 15–70 years were enrolled in an unblinded randomized control trial that began in August 2008. All subjects were healthy and did not have any underlying diseases. Subjects were excluded if they were taking vitamin D ≥400 IU/d before being included in the study. After inclusion, subjects were excluded from the final analysis if they were intolerant to the supplement or were lost to follow-up. Subjects were then randomly assigned into two groups, using a computer-generated randomized code, to receive 400 IU/day of either vitamin D2 or vitamin D3 for 3 months. Two subjects (both of them were females) in the vitamin D2 group were excluded from the study after enrollment; one subject had gastrointestinal side effects from the calcium supplement, and the second was lost to follow-up. Final analysis was based on data from 39 subjects (32 females/7 males): 20 and 19 subjects in the vitamin D3 and D2 groups, respectively. All subjects were supplemented during the rainy or winter season and we did not allow taking any additional vitamin supplement. The treatment period was only 3 months and all subjects stayed in the same environment. In addition, there is less natural vitamin D containing food and vitamin D fortified food in Thailand. Therefore we did not assess the duration of sun exposure and the amount of daily vitamin D intake. All study participants arrived at the research unit at 0800 h after at least a 12 h overnight fast. Baseline characteristics – which included age, all medications currently in use, waist circumference (WC) and body mass index (BMI) – were recorded. Blood was collected at baseline. Subjects received either vitamin D3 (Centrum®) or vitamin D2 (MTV), as well as a calcium supplement (CaCO3) every day, and were asked to return to the clinic at 1 month and 3 months after the first visit. Fasting plasma glucose (FPG) was measured at baseline, and total serum 25(OH)D, 25(OH)D2 and 25(OH)D3 were measured at baseline and at every follow-up period. Intact plasma parathyroid hormone (PTH) was measured at baseline and 3 month. Subjects with total 25(OH)D levels <50 nmoL/L were classified as having vitamin D deficiency. 25(OH)D, 25(OH)D2 and 25(OH)D3 were reported as levels (nmol/L) and as changes from baseline over the follow-up period (1 and 3 month). All subjects received either vitamin D3 or vitamin D2 and a calcium supplement daily for 3 months. Subjects in the vitamin D3 group received 400 IU/d vitamin D3 and 675 mg/d elemental calcium [1 tablet of Centrum® (contained 400 IU of vitamin D3 and 175 mg of elemental calcium) and 1 tablet of 1250 mg CaCO3 (contained 500 mg of elemental calcium)]; subjects in the vitamin D2 group received 400 IU/d vitamin D2 and 500 mg/d elemental calcium [1 multivitamin tablet (contained 400 IU of vitamin D2) and 1 tablet of 1250 mg CaCO3 (contained 500 mg of elemental calcium)]. Compliance was assessed by tablet-counting at every return visit, and was reported as % of medicine taken. All subjects had over 90% compliance for calcium, vitamin D2 and vitamin D3. Serum and plasma samples were kept frozen at −80°C until analysis. Plasma intact parathyroid hormone (PTH) was determined by electrochemiluminescence immunoassay with an Elecsys 2010 analyzer (Roche Diagnostics, Mannheim, Germany). Serum 25(OH)D2 and 25(OH)D3 were analyzed by LC-MS/MS with an Agilent 1200 Infinity liquid chromatograph (Agilent Technologies, Waldbronn, Germany) coupled to a QTRAP® 5500 tandem mass spectrometer (AB SCIEX, Foster City, CA, USA) using a MassChrom® 25-OH-Vitamin D3/D2 diagnostics kit (ChromSystems, Munich, Germany). The summation of serum 25(OH)D2 and 25(OH)D3 was used to reflect vitamin D status. The inter-assay and intra-assay coefficients of variation of serum total 25(OH)D level were 6.3% and 5.0%, respectively. DNA was extracted from a 200 μL serum sample using a QIAamp® DNA Blood Mini Kit (Qiagen, Hilden, Germany) according to the manufacturer’s protocol. Individual genotyping of rs4588 in the DBP gene was performed using real-time PCR (TaqMan® MGB probes): 20 ng of DNA was added into the PCR reaction, consisting of TaqMan Universal Master Mix (1×) and TaqMan MGB probes for intronic C/A SNP rs4588 (1×) in a total volume of 20 μL. The real-time PCR reaction protocol was 10 min at 95°C, 40 cycles of 15 s at 92°C, and 1 min at 60°C using a 7500 Real-Time PCR System (Applied Biosystems, Foster City, CA, USA). Data were expressed as mean ± SEM unless stated otherwise. We performed non-parametric test to compare the difference between parameters. We used the Mann–Whitney test and the Chi-Square test to compare the difference of baseline characteristics and changes in vitamin D metabolites [total 25(OH)D, 25(OH)D2 and 25(OH)D3] between groups of subjects stratified by vitamin D preparations and DBP genotypes. The changes of vitamin D metabolites at the 1st and 3rd month from baseline in each group of subjects were assessed by the Wilcoxon test. All statistical analyses were performed with SPSS version 16 (SPSS, Chicago, IL). A P value of <0.05 was considered statistically significant. Thirty-nine subjects (82.05% female) with a mean age of 36.2 ± 1.3 were included in the final analysis. All baseline characteristics of subjects in both vitamin D3 and vitamin D2 groups were similar (Table 1). Twenty-four out of 39 subjects (61.5%) had vitamin D deficiency [25(OH)D less than 50 nmol/L]: 14 and 10 subjects in the vitamin D3 and vitamin D2 groups, respectively (p = NS). 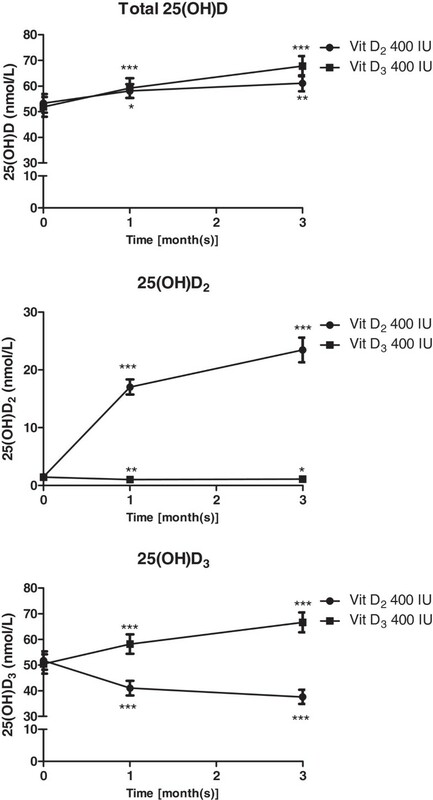 As shown in Figures 1 and 2, after receiving 400 IU/d vitamin D3, 25(OH)D3 levels increased significantly (7.8 ± 1.5 and 16.2 ± 4.2 nmol/L at the 1st and the 3rd month, respectively; p < 0.001), with a small concurrent decrease in 25(OH)D2. Among subjects who received 400 IU/d vitamin D2, serum 25(OH)D2 levels increased by 15.6 ± 1.3 and 22.0 ± 2.1 nmol/L at the 1st and 3rd month, respectively; there was, however, a significant decrease of serum 25(OH)D3 (−14.2 ± 2.0 nmol/L at the 3rd month; p < 0.001). This resulted in a reduction in the increase of total 25(OH)D levels after vitamin D2 supplementation. Nevertheless, when compared between the vitamin D2 and D3 groups, there were no significant difference in total 25(OH)D levels at 3 months from baseline [total 25(OH)D = 61 ± 3.1 vs. 67.6 ± 3.9 nmol/L and the increased of total 25(OH)D from baseline = 7.8 ± 2.2 vs. 15.9 ± 4.3 nmol/L (p = 0.08) for vitamin D2 and vitamin D3 group, respectively; Figure 1A). At the 3rd month, plasma intact PTH was decreased significantly from baseline in subjects of both vitamin D2 [−0.6 ± 0.3 pmol/L, p < 0.05] and D3 group [−0.7 ± 0.2 pmol/L, p < 0.01]. There was no difference in the decrement in intact PTH between 2 groups (p = 0.7). Data is presented as mean ± SEM. Total 25(OH)D, 25(OH)D 2 and 25(OH)D 3 levels at baseline, and at 1 and 3 months after vitamin D 3 or vitamin D 2 supplementation. The differences of total 25(OH)D, 25(OH)D 2 and 25(OH)D 3 levels from baseline at 1 and 3 months after vitamin D 3 or vitamin D 2 supplementation. Table 2 shows the genotype distribution of the DBP rs4588 SNP. The genotype distributions of subjects given vitamin D3 or vitamin D2 supplements were not significantly different. Subjects in each vitamin D supplementation group were then divided into two subgroups based on the presence of the A (minor) allele: those homozygous for the C allele (group 1), and the rest (CA or AA: group 2). When we compared baseline 25(OH)D and 25(OH)D3 levels in subjects between group 1 (n = 22) and group 2 (n = 17), there was no difference in either baseline 25(OH)D (52.9 ± 4 vs. 52.1 ± 3 nmol/L, p = 0.5) or baseline 25(OH)D3 levels (51.4 ± 4.1 vs. 50.6 ± 3 nmol/L, p = 0.6). We further classified subjects into 4 groups according to DBP genotype and type of vitamin D supplement (Table 3). While there was no difference in age, gender, BMI, and baseline 25(OH)D2, 25(OH)D3 and total 25(OH)D between the genotypes among subjects in the vitamin D2 group, some differences were found in gender, baseline 25(OH)D3 and total 25(OH)D between the genotypes among subjects in the vitamin D3 group (Table 3). When comparing changes in vitamin D metabolites at 3 months with baseline values (Table 4), it was found that subjects in group 2 (CA or AA alleles) had significantly less increase in 25(OH)D3 levels after taking vitamin D3. Likewise, the increment in total 25(OH)D was lower. On the other hand, no difference in the increments of 25(OH)D3, 25(OH)D2 or total 25(OH)D was detected between the two genotype groups when the supplement was vitamin D2. There was no difference in changes in serum intact PTH between two DBP genotype subgroups after 3 months of vitamin D supplementation (Table 4). In the present study, 400 IU/day of vitamin D3 tended to increase total 25(OH)D levels more when compared with the same dosage of vitamin D2 (p = 0.08). The underlying basis for this finding appears to be a concurrent decrease in 25(OH)D3 after supplementation with vitamin D2. This finding is in keeping with a number of studies which demonstrated a decrease in 25(OH)D3 after vitamin D2 supplementation either daily or weekly [8–10]. However, there was also one other study which could not demonstrate a concurrent decrease in 25(OH)D3, and found that vitamin D2 and D3 were equipotent in improving vitamin D status . It is noteworthy that nearly all of the studies that demonstrated less efficacy of vitamin D2 in increasing 25(OH)D levels used relatively higher doses of vitamin D, indicating that the less efficacy of vitamin D2 may be dose-dependent [9, 12]. The recent meta-analysis indicated that vitamin D3 is more efficacious at raising serum 25(OH)D concentration when given as a bolus dose [50,000 IU single dose (oral), 300,000 IU single dose (oral and intramuscular) and 50,000 IU/month (oral); p = 0.0002] compared with administration of vitamin D2, but the effect was lost with daily supplement [1,000-4,000 IU/d; p = 0.10] . However, our findings suggest that this is not the case, since we were able to demonstrate the trend of the difference between D3 and D2 supplementation even at a lower dose, i.e. 400 IU daily. All of the previous studies were performed in Caucasians, and it is unclear if ethnic differences in vitamin D metabolism could be the basis of our findings. The decrease in 25(OH)D3 after vitamin D2 supplementation, same as reported in the study of Demetriou ET, et al. , likely due to competition for the 25-hydroxylase enzyme by vitamin D3 and vitamin D2. However, it is probable that enzymatic catalyzation by other enzymes with relatively minor roles, such as CYP24A1  and CYP3A4, may be different for vitamin D3 and D2, and thus be partially accountable for the observation. The ability of either vitamin D2 or vitamin D3 to increase circulating 25(OH)D varies considerably among individuals. The explanations for the large between-individual difference include differences in adiposity , enzymatic degradation of vitamin D metabolites , and dietary composition , as well as fat malabsorption . In the present study, vitamin D2 or vitamin D3 supplementation resulted in varying increases in 25(OH)D. No association with adiposity as assessed by BMI, however, was demonstrated. Since the number of study subjects was small, the lack of power to detect association could possibly be responsible. Dietary composition and enzymatic degradation of vitamin D metabolites were not assessed in the present study. The present study demonstrated that DBP genetic variation is another factor which can influence the responsiveness to vitamin D supplementation. The major function of DBP is the binding, solubilization and transport of vitamin D and its metabolites . A previous study found that both serum 25(OH)D3 and 1, 25(OH)2D3 concentrations were significantly lower in mice lacking DBP, compared to wild-type mice . In another recent study, Lauridsen et al. showed that DBP phenotype determines the median plasma concentration of 25(OH)D3 and 1, 25(OH)2D3. With regard to genetic variation, single nucleotide polymorphisms in the DBP gene have been demonstrated to be related to 25(OH)D levels in Caucasians and Africans [4, 6]. A difference in the response of serum 25(OH)D after vitamin D3 supplementation according to DBP genetic variants has also been reported . It is of note that the DBP genetic variants affected the change in vitamin D status only for vitamin D3 but not vitamin D2 supplementation in our study. One study reported that vitamin D3 had greater affinity for the DBP than vitamin D2 and 25(OH)D3 also had greater affinity for the DBP than 25(OH)D2. However, the binding capacity of DBP cannot totally explain the difference in responsiveness to vitamin D3 supplementation as demonstrated in Armas, LA.’s study . After receiving single dose of 50,000 vitamin D3 or vitamin D2 orally, a similar rising of 25(OH)D levels in the first 3 days were observed in both group. However, much more rapid decline of serum 25(OH)D in the vitamin D2-treated subjects after 3 days seem to reflect substantially more rapid metabolism or clearance of the vitamin D2 metabolite . We speculated that the greater affinity of 25(OH)D3 for the DBP and less clearance of 25(OH)D3 would maintain its serum levels and accountable for the influence of DBP genetic variants in the case of vitamin D3,not vitamin D2. Further studies such as the differences in metabolism between vitamin D2 and vitamin D3 after binding to DBP are warranted. There are a number of limitations in this study. The sample size is relatively small and may not have enough power to detect small changes, particularly those related to vitamin D2 supplementation. A 50 nmol/L difference in baseline 25(OH)D2 and 25(OH)D3 was present. This may influence the increment of 25(OH)D2 or 25(OH)D3 levels after receiving vitamin D2 or vitamin D3 supplementation, and thus possibly affect the total 25(OH)D levels at the end of the study. The change in 25(OH)D at the end of the study may also be influenced by lifestyle factors influencing the degree of sun exposure during the course of the study. This potential confounding effect cannot be assessed since there was not a non-supplemented group in our study. It would be important to know if both the vitamin D2 and vitamin D3 supplements had the same amount of vitamin D. However, vitamin D contents of both preparations were not measured. However, total 25(OH)D levels of subjects in both groups were similar at 3 months, suggesting that the variability in vitamin D content between vitamin D2 and vitamin D3 preparations, if any existed, was likely to be small. The other limitation is that multivitamin tablets containing vitamin D were used (in the vitamin D2 group), and it is unknown if other constituents of the multivitamin would affect vitamin D absorption or metabolism. It has been demonstrated that statins, atorvastatin and rosuvastatin in particular, can influence the circulating levels of 25(OH)D [21–23]. To our knowledge, no interference from common vitamins and minerals with vitamin D metabolism has been reported. Daily supplementation with vitamin D2 tended to result in lower total 25(OH)D levels than supplementation with vitamin D3 due to a concurrent decrease in 25(OH)D3 levels in the former case. Genetic variation in vitamin D binding protein (rs4588 SNP) influences responsiveness to vitamin D3 but not vitamin D2. Address all correspondence an requests for reprints to : Hataikarn Nimitphong, M.D., at Division of Endocrinology and Metabolism, Department of Medicine, Faculty of Medicine, Ramathibodi Hospital, Rama 6 Rd., Rajthevi, Bangkok 10400, Thailand; Email: http://hataikarnn@hotmail.com, This work was supported by the Faculty Research fund, Ramathibodi Hospital. The authors have nothing to declare. HN and BO conceived of the study, participated in its design and coordination, performed the statistical analysis and helped to draft the manuscript. SS carried out the genotyping of rs4588 in the DBP gene. SC carried out the biochemical measurement. LC carried out the vitamin D metabolites measurement (LC-MS/MS). All authors read and approved the final manuscript.